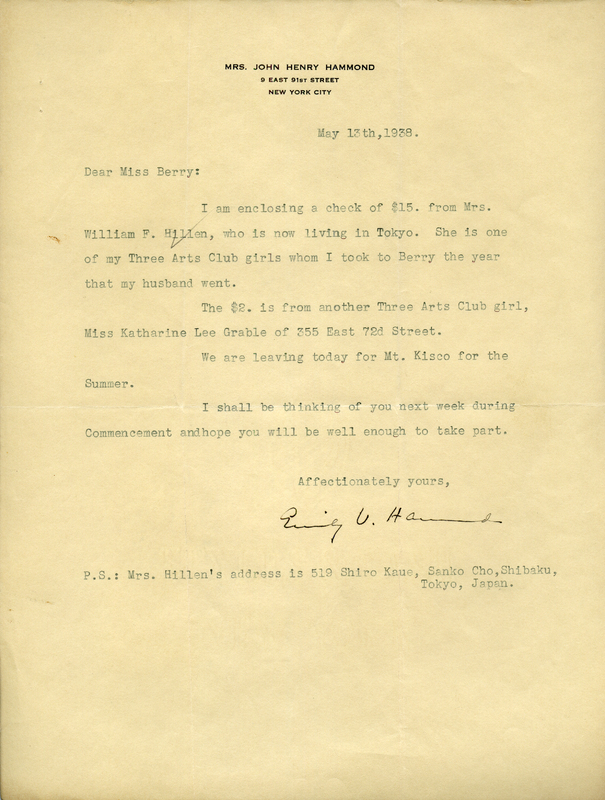 Mrs. Hammond sent Martha Berry a check for $15 from a woman named Mrs. William Hillen who just moved to Tokyo and another check for $2 from a different woman, Miss Katharine Grable. Mrs. John Henry Hammond, “Letter to Martha Berry From Mrs. John Henry Hammond.” Martha Berry Digital Archive. Eds. Schlitz, Stephanie A., Cassie LaJeunesse, Savannah Harris, Jessica Hornbuckle, et al. Mount Berry: Berry College, 2016. accessed April 20, 2019, https://mbda.berry.edu/items/show/14330.